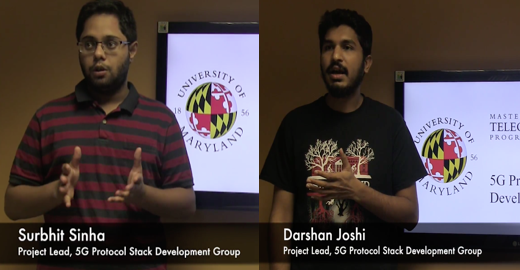 University of Maryland (UMD) Master's Program in Telecommunications (ENTS) 5G Protocol Stack Development Group is established to study LTE and LTE-A protocols leading to 5G technology for collective knowledge enhancement and training of its member students. The group will focus on developing open source LTE stack, envisioning to improve the functionalities of existing open source stack. Team Members: Deepika Shastri, Deviprasath Naidu, Swanand Bhave, Ankit Kothari, Prachi Somkuwar, Priyanka Vivek Zambre, Sachi Agrawal, Nirav Gori, Pankil Chokshi.